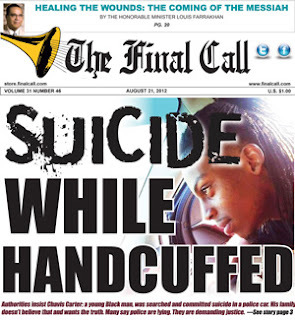 In this week's edition of The Final Call Newspaper, National Correspondent Charlene Muhammad gives an in-depth look into the suspicious death of Chavis Carter in Jonesboro, Arkansas. (FinalCall.com) - Theresa Carter doesn’t believe police claims that her son shot himself to death with his hands cuffed behind his back in a police cruiser. She is hurting and wants to know what happened in the last moments of life for 21-year-old Chavis Carter, who died in the custody of Jonesboro, Ark., police after a traffic stop. A growing number of people also want the truth and others believe the young Black man was killed by police. The suicide story, they say, is ludicrous.